Get in it to win it with a carbon fiber ring or wedding band from Titanium-Buzz. Carbon ring is more than a trend; it's the new face of jewelry, and a premier choice for guys who don't mind straying from the traditional. 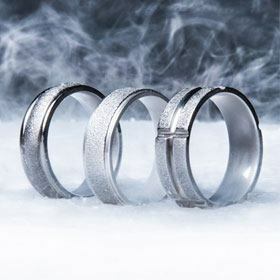 Carbon wedding bands are not only beautiful, but they're also practical. These rings are more comfortable than other materials and provide added durability thanks to our unique, four-stage process that converts polyacrylonitrile (PAN), an aircraft-grade synthetic polymer, into carbon fiber. The result is a super-tough and great-looking jewelry option. Our bestselling collection includes styles ranging from 100% pure carbon fiber to carbon fiber wedding band for him mixed with exotic metals and brilliant accents. The rise in popularity of our carbon fiber rings for men has driven us to explore new forms, new metal combinations, and new looks we're sure you'll love. Here you'll find unique wedding bands as well as fun favorites that can be worn as everyday accents. Each carbon fiber ring tells its own story, and with options such as our matte finish black carbon fiber ring, the legend of this durable jewelry will last a long time. 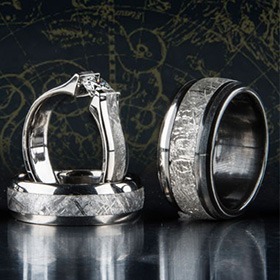 If you're looking for an uncommon wedding ring that'll keep up with your active lifestyle, we can't recommend our silver or black carbon fiber rings enough. 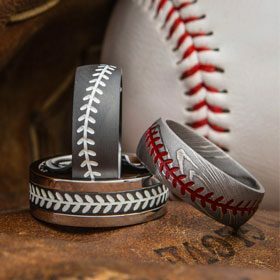 Carbon fiber wedding bands from Titanium-Buzz come in an endless array of styles - tire tracks, stitched patterns, colored inlays, and leather-like textures are just a few - so you're pretty much guaranteed to find one that speaks to you. Love things a little bit avant-garde? Pick up a men's diamond carbon fiber wedding band with a bit of classic sparkle or keep things tough and tasteful with an all-black carbon fiber wedding ring that's over-the-top cool but a little different, too. How far will we go to bring you a fresh way to pop the question? You can even pick up a diamond-studded style that makes a really cool carbon fiber engagement ring. These ladies' rings are designed to help showcase her unique sense of style, but they still feature some traditional elements for a classic flair. For example, our Women's Cobalt and Carbon Fiber Engagement Ring blends tough cobalt and carbon fiber materials with a sparkling, princess cut center stone for a little bit of bling. Replace your old wedding rings with carbon fiber wedding bands and enjoy wearing a carbon ring that will last a lifetime. Carbon fiber is extremely durable and resists most scratches and scuffs. When we make our mens carbon fiber wedding bands, they go through a treatment phase that allows the material to create new bonds for better cohesion and strength. The finished material is then usually coated with an epoxy, which helps prevent future wear and tear. The result of this process is a super-tough carbon fiber ring that's thin, lightweight, and comfortable, but strong enough to withstand the most punishing forces. It doesn't matter if you pick a style that's made from 100% carbon fiber or one that's paired up with another exotic metal, the result is the same: beautiful, long-lasting, and overall unstoppable. Our Carbon Rings are proudly made in the U.S. for quality you can see. We offer an extensive selection of rings that are priced low so you can get the look you crave without breaking the bank. 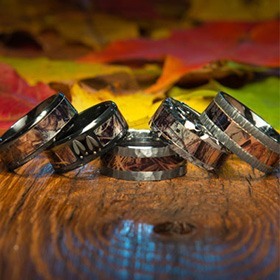 Each our carbon wedding band qualifies for free shipping to addresses in the U.S. for an even greater value. Have questions about any of the designs featured here? Want to talk about carbon fiber or any of the materials we use? Want to pitch us an idea for a custom design? Go for it! Give us a call at 1-866-215-1861 or send us an email. We're looking forward to it. Discover more great men’s wedding bands and find the most suitable for you.